A leading advocate for an open and secure Internet and an expert in global Internet governance and cooperation, Theresa Swinehart is the Senior Advisor to the President on Global Strategy at ICANN. She works with stakeholders and policymakers around the globe to advocate the Internet’s multistakeholder model, and oversees a team with overarching responsibility for a range of initiatives including development of the organization’s five-year strategic plan. She rejoins ICANN after serving three years as the Executive Director of Global Internet Policy for Verizon Communications, where she specialized in emerging issues and stakeholder and policy leader engagement. Theresa spent nearly ten years at ICANN prior to joining Verizon in 2010. 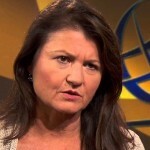 Her previous position at ICANN was as Vice President, Global and Strategic Partnerships, at ICANN. Her responsibilities included contributing to its reform process, leading the international team, the organization’s strategy for global engagement and outreach, and representing the organization in international forums, particularly those relating to Internet governance. She worked with a wide range of stakeholders, including business, regional and international organizations (governmental and non-governmental), technical community, government and civil society, on a range of issues bridging technical, political and policy expertise and experience (e.g. Internationalized Domain Names (IDNs)). Before joining ICANN, Theresa was Director for Global E-Commerce at MCI, where she was responsible for emerging international Internet issues, including ISP liability, data protection and the company’s participation in Internet related forums including the formation of ICANN. Theresa began her career in international human rights with a focus on economic, social, cultural, civil and political rights. Theresa holds a law degree from American University Washington College of Law (USA), a post graduate degree in International Studies from the University of Vienna (Austria), and a BA in International Relations from the University of California, Davis (USA). She has represented organizations in numerous international forums. She serves on the ISOC Board of Trustees and the Internet Governance Forum MultistakeholderAdvisory Committee (MAG). She is fluent in English and German and conversant in French.